Heloise Cullen is a grad student of the Design and Technology program at Parsons The New School, studying the intersections in between creativity and technology. Comes from a background in Design at Universidade de Brasília, Brasil. Joe Hamilton, Indirect Flights (2015). Screenshot, detail. Indirect Flights (2015), an online work by Joe Hamilton with sound by J.G. 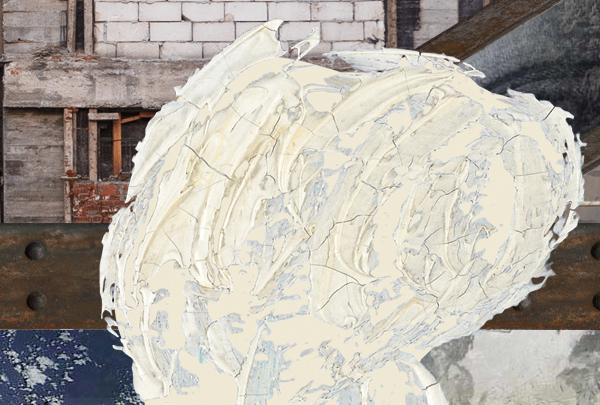 Biberkopf and support from The Moving Museum, blends satellite images, organic textures, brush strokes, and architectural fragments into a dense panorama accessible via a Google Maps-like interface at the website www.indirect.flights. Rhizome's summer fellow Heloïse Cullen talked Hamilton about the project via email. Navigating through indirect.flights I had a feeling of walking on the streets, smartphone on hands. I also felt a distance from actually being surrounded by natural landscapes (which for me is rather sad). The layers that show nature seem distant from a human—immersed—point of view, satellite images, mostly layered in the far bottom layer, watched while I navigated listening to urban sounds. I can see how you felt a distance to the elements of nature in the work. The piece is rather dystopian when looked at in a certain light. Many elements are forced in the frame, overlapping and fighting for their own presence. A lot of the visual material is weathered and messy although still very high resolution and crisp. I didn't set about creating a piece about dystopia but It seems appropriate that some viewers could read it as such. I sent the indirect.flights link the other day via SMS to a friend who was asking "what's net art?" and I was surprised to notice it works really well on mobile. A lot of net art doesn't work that well on mobile—was this a specific decision on your part? It was super important for me that the work function well on mobile. To start with I think it's meaningful for some viewers to experience the work in transit on a touch screen. The work is navigated in a way similar to online maps and mobile has become the default way of using a map now. Secondly, people are increasingly accessing the internet through mobile devices so it's just good practice for anything put online to be optimised for mobile. You’ve said that interfaces are "pivotal in shaping communities online." How do map interfaces, which you reference with indirect.flights, shape communities, especially since they’re so often used as we travel through what used to be thought of as "offline" space?